Ordering pizza from the nice old man at Pizza School? Safe. Walking into one of the Korean restaurants alone with an all-Korean menu and knowing what to order? Scary. Buying snacks at the convenience stores? Safe. Getting my hair cut? Scary. Paying my bills at an ATM that has an English menu? Safe. Trying to return an item to a store? Scary. You get the picture. But it's not like I'm living in constant fear of the scary things, nor always consciously avoiding them. Rather, I've adjusted to a life of the comfortable tasks and those tasks have turned into habits. Running on autopilot can be dangerous though, like on Friday when it hit me that I've lived here for over three months and had yet to step foot in the town's public library! So after school on Friday I stopped at the public library before heading home (it's right next to the elementary school). I still can't believe it took me this long to visit. I suppose I haven't been short on books, as there's lots to read on my kindle and I keep on checking out digital books from my home library. But regardless, I went! It's a really nice building, I'm assuming it's somewhat new. I'll have to bring my digital camera next time for pictures; my phone camera would have been obnoxiously loud (it's a Korean cell phone, so it's impossible to turn off the camera shutter noise). I saw many books I would like to check out later, but it takes three days to get a library card after applying online (a teacher at school told me that). I wasn't sure what website to go to, so I played dumb and went up to the librarian at the counter. I made a rectangle with my hands and said "I need a library card?" in English... (I hadn't planned for a library trip that day, so I hadn't looked up any new Korean words!). She led me over to a computer and did some clicking on the website (all in Korean) until there was a button for foreign library card applications that said "English" (next to "Chinese" and "Japanese"). She clicked "English" and left me to it. I filled everything out, but when I clicked submit at the bottom, the information never went through. I waited and waited. Clicked again. But the browser stayed on the same screen. I wasn't sure what to ask the librarian (she didn't speak English), but I looked for her back at the counter and she had disappeared. By now I had spent a decent amount of time looking at books (and trying to sign up for a card), so I decided to leave and pick up dinner (from Pizza School!) I'll go back this week and see if it worked, or try applying again. I never intended to grow my "safe" list this weekend, but I ended up pushing my comfort boundaries on Sunday, too. During one of my walks through town this fall, I noticed a Chinese restaurant. 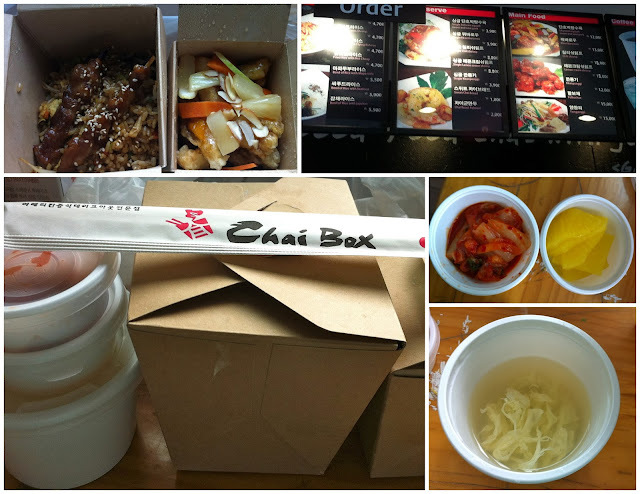 I know that Chinese always does take-out, and I was curious to see what Korean Chinese food tasted like. But I put the idea in my back pocket, and never found the occasion (or courage) to go in alone. I decided to do it yesterday, but then I had enough pizza leftovers to last me lunch and dinner (and I really didn't feel like leaving the house). Ok, so Sunday it is. This afternoon I'm feeling ready and amped up. I put on my coat, walk straight to the Chinese place, reach to open the door, aaand it was locked. What?! I walk around the building once to see if there's not another entrance. Nope, this was obviously the only main entrance. Then I notice a sign taped to the door. I assume it says that they are closed at that moment, or maybe it says when they would return. So I keep walking and wandering around. Where will I go instead? It has to be somewhere new, since I'm in this determined mood to push at my comfort zone. This feeling doesn't come every day, so I must take advantage of it! There's a small burger place on the main street that I've never been to. I think they would have a menu in Korean and English, or at least it wouldn't be so busy that they could be patient with my slow reading skills. Besides, a burger menu can't be so hard to figure out, can it? So I'm walking back towards that way, and then I look down a back ally I've never walked down before. It's kind of a street. I'm glancing around, looking for restaurants. They look closed. Then in the distance I see "Chai Box TAKE OUT". Hmm, what's that? I turn in and walk towards it. There's a huge "Grand Opening" sign outside, and then I see the magic words: Chinese Take-out. So perfect! Good thing I came walking this way. I head right in and check out the menu. The big menu up by where you order is in Korean and English. I order in Korean, reading from the menu painfully slow. The first one wasn't too hard (chicken fried rice), because the Korean sounds somewhat like "Chicken Ri-ee-ce-uh". The second thing I ordered was a lot longer (a pork and squash dish), so I took an audibly big breath before I tackled it, while telling myself "Okay, you can do this!"). The guy cut me off halfway through and said the whole thing quickly, with a raised intonation at the end indicating a question. "Nay" (Yes), I told him, even though I wasn't sure if he'd said what I wanted to order or not. When I finished paying, I looked at the receipt to double check the second item. It was right. I stayed standing, and the guy said some more stuff to me that I didn't understand, but by his hand motion I thought he was telling me to sit down at any of the open tables. "Take-out" had been the first word I'd spoken to him before ordering, but somehow that had gotten lost in the process. (A more probable story is that he asked if I was eating there, and I answered "yes"...). This was quickly fixed, and I heard him yell back in the kitchen "take-out"! I felt so accomplished walking home with my Chinese take-out bag, and even more satisfied while eating it. Mundane tasks can be burdensome while living abroad, but it's these very same tasks that can bring about great feelings of triumph and pleasure.